Discover the magic of Madagascar at Parc Ivoloina (eev’-uh-lah-ween). Observe twelve different varieties of lemurs including free-ranging species as well as an assortment of native reptiles and amphibians like our famous chameleons and tomato frogs. Take a guided tour, explore the forest on one of many walking trails, enjoy a picnic lunch, and cool off in a waterfall. This unique site features a 4-hectare zoological facility within a 282-hectare forestry station. While it is not required to have a guide, it is highly recommended. You can enjoy a full meal or just pick up a snack and drinks at the Thirsty Dronga. A gift shop features unique and delightful crafts made by Malagasy artisans as well as postcards, t-shirts, and other souvenirs of your visit. Located just 30 to 40 minutes north of Toamasina (also known as Tamatave), Ivoloina is close enough for a half-day trip from a cruise ship. With so many things to do and see, however, one can easily spend a full day or two hiking our nine kilometers of well-maintained hiking trails, scheduling a nocturnal lemur tour, wandering our gardens and orchards, exploring historic ruins, and relaxing by the lake. You can even arrange to stay overnight. Everyone's visit includes time here. This four-hectare zoo features wildlife endemic to Madagascar including our famous lemurs. We care for critically endangered black and white ruffed lemurs, greater bamboo lemurs and blue-eyed black lemurs as well as nocturnal lemurs like the famous aye-aye. You will also see tortoises, boas, tomato frogs, and panther chameleons. ​In addition to the species directly in our care, there are a variety of free-ranging lemurs to look for in the trees overhead. The Zoo also serves as a government-authorized site to care for animals confiscated from the illegal wildlife trade.This is also where critically endangered lemurs were born that are now contributing to the longterm survival of their species in breeding programs outside of Madagascar. With fascinating objects like a giant egg from the extinct 3-meter tall elephant bird, the Center introduces you to many of the fascinating aspects of our remarkable island. The informational graphics, artifacts, and displays give you a better understanding of the different lands and biodiversity as well as some of the programs the Parc is involved in to protect it. This experience is so much more meaningful with a guide so be sure to arrange a tour. This represents the largest site within the Parc for guests to explore or take a guided experience. It includes all the forested sections, the lakes, waterfall, 9 km of hiking trails, picnic areas, and a campsite. For the birder, malachite kingfishers, white-faced whistling ducks and many other bird species spend time around Lake Fulgence. From an education standpoint, the forestry station plays an important role as the field site where students can gain hands-on experience in conservation research and monitoring methods such as flora and fauna surveys, GIS and habitat measurements. This site is comprised of multiple demonstration areas and nurseries that show different products (e.g.,vegetables, fruits, medicinal plants) and farming techniques (e.g., intensive rice cultivation, composting, preparing terraces along the curvature of the land). While not part of most guests' visit, the ICTC is a crucial resource as the Parc. It includes a spacious conference room and equipped laboratory. The dormitory and kitchen/dining hall were built to provide more people who live in rural areas with the opportunity to attend workshops because lodging or the time and expense of travelling back and forth to their homes can pose significant challenges. Are you concerned about supporting facilities that may not reflect your values regarding wildlife and conservation? Parc Ivoloina is operated by the non-profit organization Madagascar Fauna & Flora Group (MFG), an international consortium of zoos, botanical gardens, and universities dedicated to the conservation of Madagascar's rich biodiversity. Ivoloina assists the Malagasy government by caring for animals seized in the illegal wildlife trade and cooperates in international breeding programs for endangered species. . 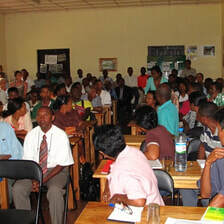 Numerous capacity building endeavors have been undertaken through cooperative programs with Malagasy universities and through seminars offered at the Ivoloina Conservation Training Center. 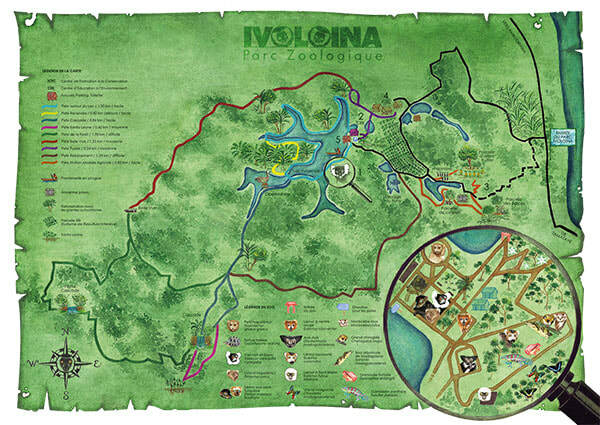 Parc Ivoloina has been operated by the nonprofit Madagascar Fauna and Flora Group since 1988. This international consortium consists of zoos, botanical gardens, and universities located in Europe, North America, Africa, Australasia,and Asia. Your visit and donations support our conservation and education efforts for the people and lands of eastern Madagascar.